A brochure from Red Bud Industries introduces the Eco Picked Surface (EPS) process as an environmentally friendly direct replacement for acid pickling. Comparatively, EPS lines consume less floor space and are less expensive to operate. The process uses a slurry mixture of water and steel grit propelled onto the strip in a uniform stream to remove surface scale. 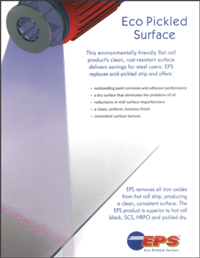 The EPS process also can reduce common mill imperfections such as roll marks, pitting and silicon streaks. And, according to Red Bud, EPS-processed steel resists rusting longer than does pickled steel, and it can be shipped dry to customers, eliminating the need to oil the material. The brochure goes on to explain the benefits of the EPS process when welding, stamping and rollforming. See also: Red Bud Industries, Inc.